Johnny Lee Wright, 49, of Landrum, passed away April 8, 2019 at Spartanburg Regional Medical Center. He is the son of Larry Thomas Wright and husband of the late Calista Nodine Wright. He was of the Bapist faith. 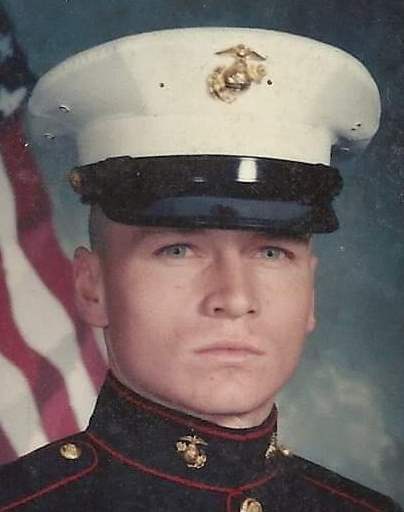 He was a US Marine, serving during Desert Storm and a member of the DAV and VFW. He was retired from the US Postal Service and he loved to fish and hunt. He is survived by his daughters, Logan and Kinslee Wright; brothers, Larry and Tim Wright; mother and father-in-law, Doug and Peggy Nodine; and his niece and goddaughter, Katie Wright. The family will receive friends from 1:00-2:00pm on Friday, April 12, 2019 at Petty Funeral Home. Funeral services will follow at 2:00pm in the funeral home chapel conducted by Rev. Jimmy Camp. Entombment will be in Evergreen Memorial Gardens. In lieu of flowers, memorials may be made to the Lee Wright Memorial Scholarship Fund, C/O First Citizens Bank, 144 North Trade Ave, Landrum, SC 29356. The family is at the home of Doug and Peggy Nodine.